400 years of discussion and we’re still not sure what creates the Earth’s magnetic field, and thus the magnetosphere, despite the importance of the latter as the only buffer between us and deadly solar wind of charged particles (made up of electrons and protons). New research raises question marks about the forces behind the magnetic field and the structure of Earth itself. The controversial new paper published in New Journal of Physics (co-owned by the Institute of Physics and the German Physical Society), ‘Secular variation of the Earth’s magnetic field: induced by the ocean flow?’, will deflect geophysicists’ attention from postulated motion of conducting fluids in the Earth’s core, the twentieth century’s answer to the mysteries of geomagnetism and magnetosphere. Professor Gregory Ryskin from the McCormick School of Engineering and Applied Science at Northwestern University in Illinois, US, has defied the long-standing convention by applying equations from magnetohydrodynamics to our oceans’ salt water (which conducts electricity) and found that the long-term changes (the secular variation) in the Earth’s main magnetic field are possibly induced by our oceans’ circulation. With calculations thus confirming Ryskin’s suspicions, there were also time and space correlations - specific indications of the integral relationship between the oceans and our magnetospheric buffer. For example, researchers had recorded changes in the intensity of current circulation in the North Atlantic; Ryskin shows that these appear strongly correlated with sharp changes in the rate of geomagnetic secular variation (“geomagnetic jerks”). Tim Smith, senior publisher of the New Journal of Physics, said, "This article is controversial and will no doubt cause vigorous debate, and possibly strong opposition, from some parts of the geomagnetism community. As the author acknowledges, the results by no means constitute a proof but they do suggest the need for further research into the possibility of a direct connection between ocean flow and the secular variation of the geomagnetic field." In the early 1920s, Einstein highlighted the large challenge that understanding our Magnetosphere poses. It was later suggested that the Earth’s magnetic field could be a result of the flow of electrically-conducting fluid deep inside the Earth acting as a dynamo. In the second half of the twentieth century, the dynamo theory, describing the process through which a rotating, convecting, and electrically conducting fluid acts to maintain a magnetic field, was used to explain how hot iron in the outer core of the Earth creates a magnetosphere. The journal paper also raises questions about the structure of our Earth’s core. Familiar text book images that illustrate a flow of hot and highly electrically-conducting fluid at the core of the Earth are based on conjecture and could now be rendered invalid. As the flow of fluids at the Earth’s core cannot be measured or observed, theories about changes in the magnetosphere have been used, inversely, to infer the existence of such flow at the core of the Earth. On a practical level, it means the next time you use a compass you might need to thank the seas and oceans for influencing the force necessary to guide the way. Dr Raymond Shaw, professor of atmospheric physics at Michigan Technological University, said, “It should be kept in mind that the idea Professor Ryskin is proposing in his paper, if valid, has the potential to deem irrelevant the ruling paradigm of geomagnetism, so it will be no surprise to find individuals who are strongly opposed or critical." Cool stuff, the oceans are quite large and complicated, so I can buy the theory. But how does one test it? "In the early 1920s, Einstein highlighted the large challenge that understanding our Magnetosphere poses." Thomas Gold proposed the name 'magnetosphere' in a 1959 paper. Einstein may have been aware of earlier work by Birkeland, Breit and others but certainly had no detailed understanding of the 'magnetosphere' as we know it today. See 'Magnetosphere chronology' here: http://en.wikiped..._history . Wouldn't the magnetic field seem to be appear stronger over the oceans if this was the case? I'm not sure if water can resist on the Earth's surface without an atmosphere (which is held in place by the magnetosphere) it will be evaporated therefore the question is how can water create the magnetosphere if it needs magnetosphere to be there in the first place? Gravity may help a bit with the whole atmosphere thing too. Earth's core is made mostly of iron (Fe) and nickel (Ni) - elements that were made near the core of a supernova [E. M. Burbidge, G. R. Burbidge, W. A. Fowler and Fred Hoyle, "Synthesis of elements in stars," Rev. Mod. Phys. vol. 29 (1957) 547]. Earth's metallic core formed first. This became the accretion site for stone meteorites (silicates) that formed further from the Sun and then had to cross the orbits of the metallic cores of terrestrial planets as the fell toward the Sun [See: Karl K. Turekian and S. P. Clark, Jr., "Inhomogeneous accumulation of the earth from the primitive solar nebula," Earth Planet. Sci. Lett. 6, 346-348 (1969)]. planets," Geochemical Journal, vol. 15 (1981) pages 245 to 267]. A few years earlier Peter Toth recognized that the Sun itself might be a pulsar [Peter Toth, "Is the Sun a pulsar?" Nature, vol. 270 (1977) pages 159 to 160]. 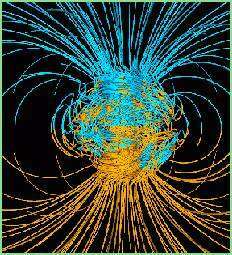 Earth's magnetic field was induced by the powerful magnetic field of the nearby pulsar on which the Sun accreted. the question is how can water create the magnetosphere if it needs magnetosphere to be there in the first place? They are correlated not because one is the cause of the other but because both are effects of a third event. Otherwise none of the data adds up to a nice pile of this-caused-that and we end up with an infinite regression! The mystery is that "third event". My guess: something way below the surface of the Sun. I don't know where you got the second of these links from but it certainly seems to back up what Prof. Ryskin is saying - namely that the largest variations in Earth's magnetic field are mostly confined to ocean areas. Of course the variation in the second jpg file are only of the order of 5% and less. It's not sufficient on its own to challenge accepted ideas about the origin and cause of Earth's Magnetosphere. Maybe the professor has stronger data. he points out that, "If secular variation is caused by the ocean flow, the entire concept of the dynamo operating in the Earth%u2019s core is called into question: there exists no other evidence of hydrodynamic flow in the core." This seems a bit of a strong claim. I would have thought that the periodic reversal of Earth's Magnetic field is pretty convincing 'other evidence' of some sort of deeply-seated fluid cause. Um, does this mean we can expect a magnetic reversal if the Polar rivers' increasing outflow stall the Gulf Stream ?? OT: How do you accrete the Sun we see atop a neutron star without it spinning up and/or going super-nova ?? question: how, according to this new theory, is the magnetosphere generated? Last time I checked salt water, while a magnificent conductor of electricity, does not generate a magnetic field. Perhaps I missed something? What about other planets like Mars and Venus? If I remember correctly, Mars has no water nor any magnetic field. Same seems to apply to Venus. Then what about salinity of the sea water? I think sea water salinity was earlier like 0.9% and is currently over 3%. Has this change affected the conductivity of sea water and therefore magnetic field strength? Do magnetic polarity reversals coincide with ice ages that probably alter the ocean currents? Last time I checked salt water, while a magnificent conductor of electricity, does not generate a magnetic field. Electrical currents generate magnetic fields. Magnetic fields generate electrical currents. I'm sorry, that isn't true yyz? Today physics have a wrong theory. Also particle emit/radiate energy all a time. particle interactive together. Earth just emit/radiate particle who absorbs some energy what this particle emit/radiate, who coming from Sun! I mean, Sune emit/radiate particle who also emit/radiate energy. Earth emit/radiate particle who can absorbs that energy. I mean that energy what this particle emit/radite, who coming from Sun. gadzometer try to explain my model with good english. He just found my Model and everything what he say, it is not right way. Uups. There is lot of thing right way ans some is not just right way. My english it is not enaf good, but i think he speak something wron way. like how star pushing themselfs far away. Star exploding and emit particle like neutriinos and also neutriinos exploding and emit kineticenergy for other star nucleus of atoms who also exploding all a time! Concepts are great, calculations are better. Where are you from to butcher English so bad? There would be always interaction between existing magnetic field and moving salt water ions, which explain why there are anomalies in the Earth magnetic field in the ocean.